Kobuton Ramen is located five minutes on foot from the Keifuku Electric Railroad’s Nishioji Sanjo Station. This shop is well known for its “all-natural” (completely free of chemical seasonings) pork bone ramen, with all the concentrated goodness pork-bone cooking has to offer. Kobuton Ramen offers “light” (thinner) and “heavy” (thicker) broths, and based on these two main foundations, a variety of ramen dishes are made for customers to enjoy. Mysteriously, while all the ramen dishes at Kobuton Ramen feature rich flavors, the gamey smell often encountered in pork bone soups is all but absent. Instead, the fragrance is a refined one of pure pork stock. The combination of deep, rich flavors and refined fragrances are most likely thanks to the shop’s “all-natural” approach (completely eschewing the use of chemical seasonings) and the slow, careful stewing of the broths over time. Not content to stop with their soups, the shop also puts significant effort into its noodles, always offering at least five different types and matching the right noodles with the right broths, cooked to perfection for customers. There is a general impression that many ramen shops in the Kansai region put a lot of effort into their broths to the detriment of their noodles, but this shop’s consistent attention to its noodles makes it something special, and the combinations of broth and noodles will have you coming back time and again for that amazing experience. The shop is small, with only eight counter seats available, but the service is excellent and the shop is always bustling with regulars as well as foreign sightseers who wander over from the nearby guest houses. Almost synonymous with Kobuton Ramen is Ton Ton - Ramen. The broth, with all the flavor of pork condensed into it, is incredibly rich and creamy. One could almost describe it as a carbonara-like ramen. The noodles have thickness and substance, and they hold the broth well enough that one can essentially finish the soup even by only eating the noodles. The toppings are simple, with red onion, roast pork and bamboo shoots, but it is actually that simplicity that brings out the beauty and deliciousness of the ramen. Lovers of thick pork bone ramen should do whatever it takes to give it a try. Kobuton Ramen has inherited another of Kobuton - Ramen’s well-known aspects—its name. The first surprise when this ramen is brought out is its refined fragrance, decidedly unorthodox for a pork bone ramen. Without a hint of any gamey smell, the refined fragrance is one of extracted and concentrated pork bone flavor, fiercely stimulating the appetite. Compared to Ton Ton - Ramen above, the broth has a somewhat smoother texture, but the flavor itself is thick, with a hint of seafood broth. Toppings include seaweed, scallions, spinach and rare roast pork, and it is obvious they have been specially selected to match the rich and flavorful soup. First-time visitors to Kobuton Ramen are advised to try this ramen as their starting point. This ramen is made with dried sardines and pure soy sauce. At first glance it looks like a thin soy sauce ramen, but it is actually a ramen with a strong seafood flavor thanks to its dried sardine broth. The savory notes of the dried sardine broth and the sweetness of the pure soy sauce make a surprisingly good match, and just one mouthful will give a sense of what a high level of perfection has been achieved with this ramen. The noodles are soft, thin and flat, and feel good going down, and what’s more, they match perfectly with the soup. The texture is gentle, and there is none of the saltiness that is so often found in soy sauce ramens. This ramen is recommended for those who like thin, seafood-style ramens. However, the scent of dried sardines is fairly strong, so those who are not into seafood should think twice before ordering this one. This rice bowl features cuts of roasted pig cartilage on top of piping hot rice. Braised until it is practically oozing, the cartilage is soft enough to stick to the chopsticks; it has then been roasted over a burner, making it smell terrific. 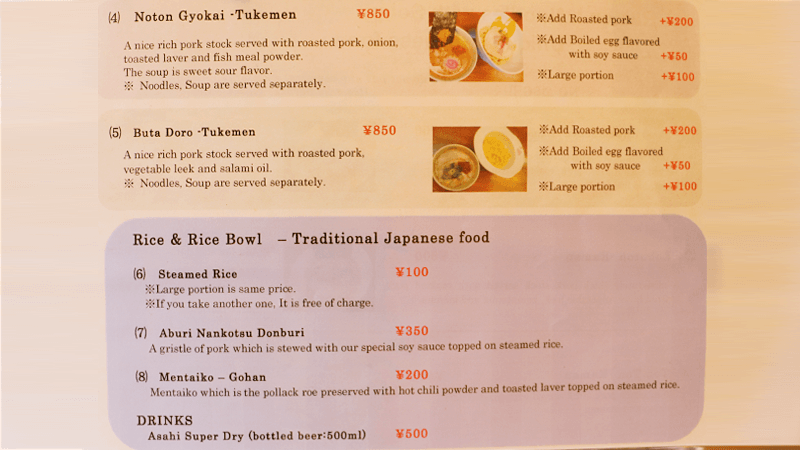 The word “cartilage” makes it sound hard, but the cartilage at [[[Kobuton Ramen]]] is anything but. Of course, it goes perfectly with the white rice, and this rice bowl is one that will jump down your throat without a second thought. The menu items are listed on the tabletop for customers to order. English menus are available on request for easy ordering. 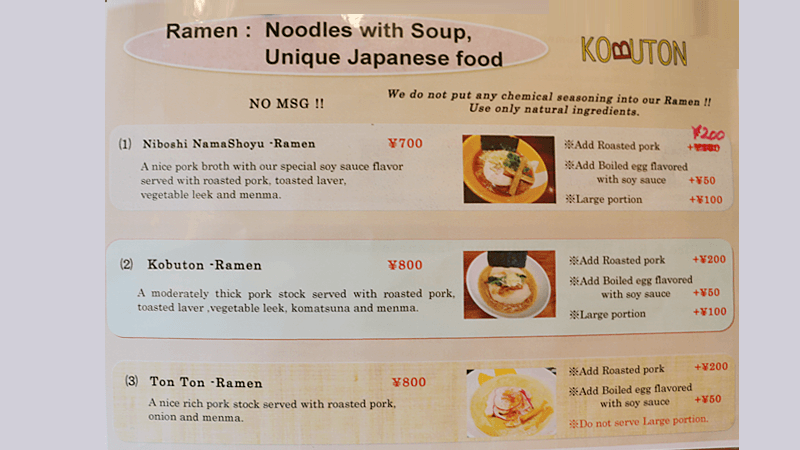 Extra noodles are available with all ramen items at Kobuton Ramen for an additional 100 yen. To order your ramen with more noodles, you can use the following to get your order across to the server. 大(Large)：Oo mori ni shitekudasai. Also, please note that noodle refills are not available at Kobuton Ramen. I have eaten more than 100 bowls of ramen in Kyoto, but whenever I want a thick pork bone ramen, I always find myself coming to this shop. 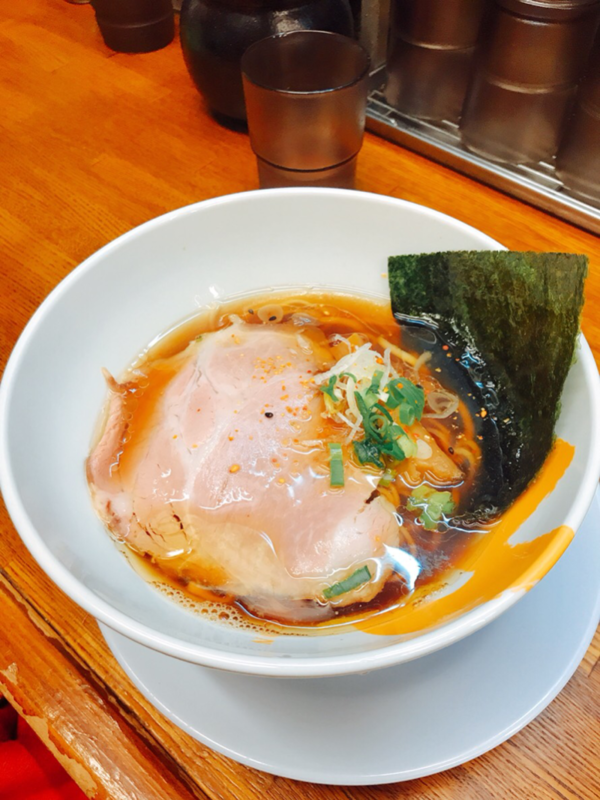 The sister shop of Tokyo’s ultra-popular ramen shop, Kobushi Ramen, Kobuton Ramen offers pork bone ramen so authentic that it is known among many as “the place to go” for thick pork bone ramen in Kyoto. 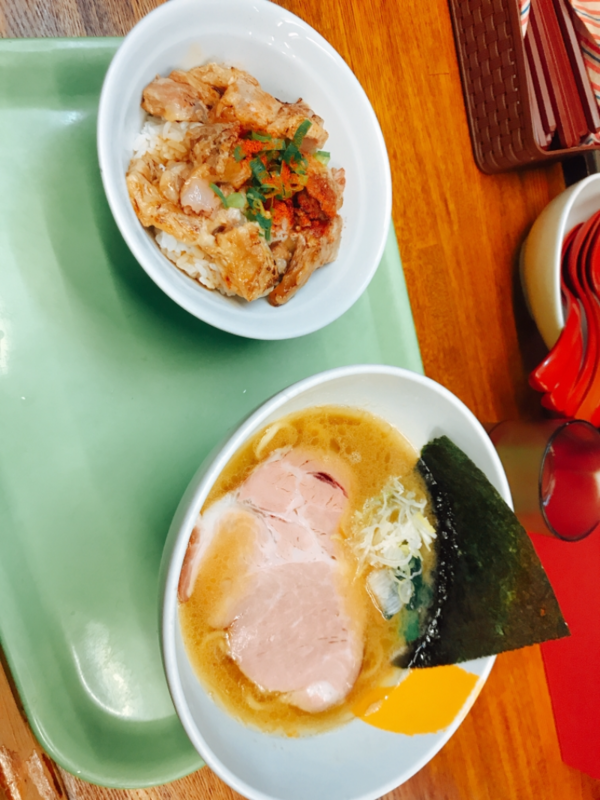 In addition, the shop is very enthusiastic about trying its hand at new varieties of ramen, and novel menu items such as “Iberian Pork Noodles” and “Kyoto Eggplant Seasoned Cold Noodles” are offered on a monthly basis. Trying out a new ramen every month is just one more way to enjoy Kobuton Ramen. 5-minute walk from Arashiyama Main Line, Keifuku Electric Railroad Nishioji-Sanjo Station. Quite crowded at lunchtime, often requiring a wait of 15-30 minutes.